I’ve spoken before about the stories of objects and my struggles to let things go because of their associations. Because of who owned them and who they were important to. And perhaps proving I’m not a complete hoarder, I do and try to have a clean out from time to time. I’m thinking about having a market stall soon, to clear out some clutter and my mother is pitching in with some of her own things. Today though, she handed me Grandma’s sewing kit to sell. Grandad had fixed the handle. He was practical with ideas to make things better. He was a fixer. It was Grandifcation. I took it home and stared at it. I remembered Grandma using it. I unpacked it of things Mum clearly didn’t intend to dispose of and I knew Mum hadn’t opened it. She couldn’t. She’d let the sewing box go, but the rest was too much. What was left in the sewing kit was unremarkable and yet these buttons and spools of cotton panicked me. I feared they were important to Grandma and I did not know it. There were two dried rose buds and I wondered if they were from a wedding. Should I keep them? This is the hardest part. Trying to reconcile objects with heartache. Trying to convince yourself that the memories matter more. The next person who inherits these things will know even less, will care even less. And while this is life and perhaps even how things should be a lump forms in my throat and my eyes ache with unshed tears. Strangely, Grandma was the most unsentimental person I’ve ever known but knowing that doesn’t make this any easier. Though, Grandad was the opposite. They were an odd couple. You won’t be sorry, promise because here I combine wonder with cuteness. On our holiday, with thanks to my patient, long-suffering husband, we travelled with a small mouse called Stowaway. We visited Ireland two years ago and it felt like home. I could say it was my Irish ancestry, but my last ancestor set foot in Ireland four generations ago – it’s not like I have relatives beckoning me back. I could say it was my vague Catholic upbringing, but it seems I only attended church (and Sunday School) to please my grandmother and The Church because my mother had to prove she’d denounced Protestantism. Pretty much like my Protestant grandmother did in the previous generation. Hypocrisy aside. I’m getting off track. Australia is home too, but Ireland resonated with me in a way I cannot easily explain. As readers here probably know, I’m not especially religious, in that, I no-longer attend church. And while religion plays a part here, this post is mostly about people. Random people who briefly shared a moment of their lives with us when we visited Ireland. In Kilkenny, I followed an older woman down the street carrying two grocery bags, one in each hand. As she walked, she shifted the groceries from her right hand to her left. She crossed herself and returned the bag to her right hand. We’d walked past a church. I don’t know why I loved this so much. It was so real and honest and an action I’d never witnessed outside of church. I have always loved churches. They’re like buildings of made of peace. History has shown us, of course, religion has caused much conflict. But churches for me are sanctuary, bundled by walls and pews. I’ve always found them to be peaceful, beautiful places. I lingered around the entrance of a church in Wexford and wondered if I should enter – could I take photos? A woman bustled up beside me. She dabbed her hand into the font at the entrance, crossed herself and went in. I followed her. She lit a candle and rested it, flickering amongst the others. She said a prayer. 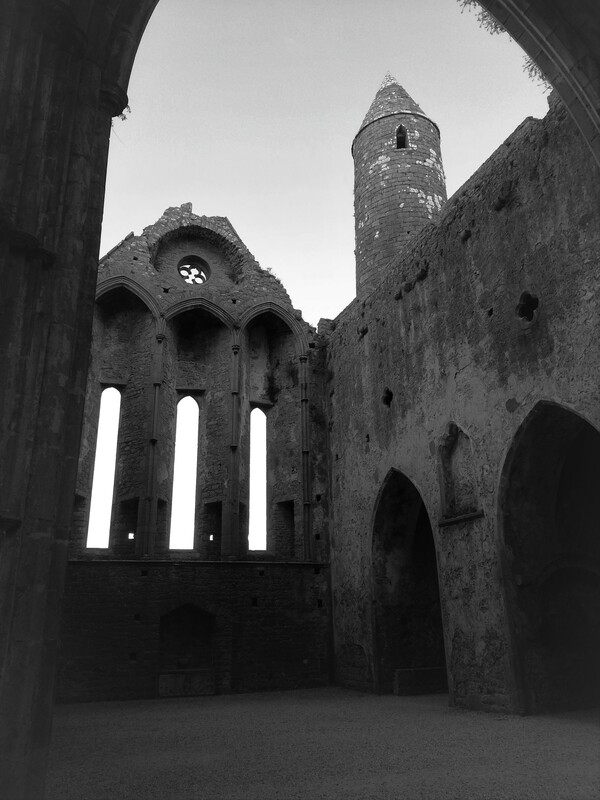 I crept around to the aisle of the church – my camera a heavy thought at my side. I marvelled at the windows and the architecture. With old habits I crossed myself and took a pew and noticed others already had – their heads lowered in thought, or prayer. I mentally confirmed with myself it wasn’t Sunday. Then I had another thought: People are actually using this church. It made me feel so areligious. Australia is so full of empty churches. I sat there. I took a moment. I didn’t take any photos. While in Wexford, we stayed at a Bed and Breakfast. It was unlike any other B&B we’d stayed in, simply because the owners had made little attempt to separate their business from their house. Essentially, we were boarding. We’d had an awkward introduction because minutes before we’d arrived, our host had received unexpected guests looking for a bed. We were ushered to our room, which wasn’t quite ready. The next morning, our host was calmer, but frustrated because the other guests had decided to sleep in for breakfast. Which was a shame, because it was delicious. We returned to the B&B after a day’s touristing, but struggled to get a park. Once inside, our host had prepared some salmon for us. She knew Seamus, who knew Peter, who knew a fisherman. She asked about my Irish roots and the places we’d been in the day, adding comments like, ‘you would have seen Eamon’ or ‘you must eat at Patrick’s’. Our host was a living street directory. They entered the kitchen and my husband and I were sitting there, munching on salmon. Introductions were made, but their conversation continued. An elderly woman in the street had passed away. Everyone knew her. She had five children and several more grandchildren and great-grandchildren. The street was in mourning and a funeral procession was expected in the coming hours. Conversation circled like this for a while. Talk of life and death and family. We asked questions which were answered honestly. The sense of community was overwhelming. We saw many wondrous things during our travels through the UK and Ireland. These unexpected and beautiful moments were among my favourites. Do you have an unexpected, wondrous moment to share? It’s a short post this evening, it’s getting late and my day was full. I’ve just got back from a family dinner and now I’m full on the inside. Full and sleepy. And that question led to thoughts on technology, and how it would be nice if I could treat this blog like early colour television for an evening. Regularly scheduled programming will be back tomorrow. I am easily amused. Most recently I posted a letter, in that old fashioned way that requires a mailman. On the box, under the word ‘Post’, someone had written ‘apocalypse’. I stood with my letter poised at the mouth of the letter box and laughed out loud. It was 1997 and I’d just emerged from a mathematics exam. I sat on a bench seat and waited for my parents to pick me up. Ten minutes transpired and I moved into the shade, the mid afternoon sun burned at my skin. On the University lawn, a sprinkler snickered its rotation in the background. Thirty minutes transpired. They were never late. I grabbed the family mobile out of my bag. Yes, the ‘family’ mobile. It WAS 1997. The battery was dead. I looked up to the phone box and stared in amazement as the lawn sprinklers rotated in and out of the semi enclosed area. I dashed in with my phone card, dialled my parent’s number and said something along the lines of ‘Everything okay? I’ve got to be quick, the sprinkler is on the phone box, hang on, I’ll be back in a second-‘ dashed out while the phone was showered with water. Have you experienced a moment in time that feels like that should be in a film or sitcom? It’s been a busy week, so I’m using a list-post prompt provided by the wondrous Rarasaur. The smell of freshly mowed grass is summer. It’s backyard cricket, it’s family picnics and barbeques. It’s holidays and weekends. It’s the day after Christmas. The scent of paper and books and stationary is contentment. Solitude. Joy. My grandfather’s shed was a mix of oil and turps and solder and saw dust and oil paints and was either cold and damp or hot and humid. It is a difficult scent to explain but when I find a scent like it, it triggers strong memories. Like stamping fake letters with his drill press and posting them, playing games, watching him work, his voice and patience and his desire to teach me about electronics and stuff I was too young to understand. The smell of hospitals and veterinary clinics and dentists remind me of anxiety and nausea. The unique scent of those we love is contentment and sanctuary. Coffee reminds me of yumminess. It is mornings and tiredness but it’s also sitting together and chatting. Of course, it also reminds me of blogging. I’m late with my post today, but I have great excuse! 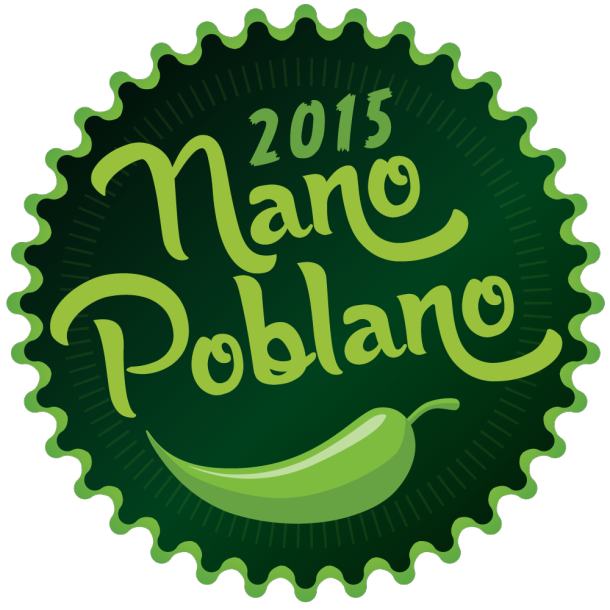 Don’t forget to visit Ra’s small community of Tiny Peppers participating in her version of NaBloPoMo. Click on the icon, and peck a crate to visit a random post. If I haven’t reached your blog yet – I promise I will!